Salt Lake County Councilwoman and Senate candidate Jenny Wilson believes Congress needs new blood. "There has to be a new generation of leaders that step up and say enough is enough. The Senate is an old boys club," she says. The buildup to Mitt Romney officially declaring his candidacy for U.S. Senate was so slow and suspenseless that by the time it finally happened, you'd be forgiven if your first thought was, "Didn't he already announce this a while ago?" Nope. Romney waited until Feb. 16 to say publicly that he intends to fill a seat Sen. Orrin Hatch, R-Utah, has been holding for the last 41 years. For plenty of Utahns, this meant all was right in the universe. 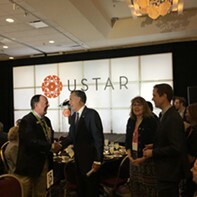 Since at least the 2012 presidential election—and, for some, long before that—Romney has remained a household name in Utah's political circles, and to them, he stands as the poster child of an effective and honest leader. But it's not just John Q. Public who's got the former Massachusetts governor's back. 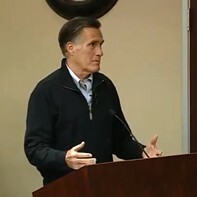 Romney gained early support from prominent party members—Hatch and Gov. Gary Herbert, to name a few. And the Republican with the highest national profile, President Donald J. Trump, also buried the hatchet with Romney—the two more often sneered at one another—and dispatched a congratulatory note via Twitter upon Romney's announcement. All that's left is the coronation. Except for one glaring detail. Romney hasn't won the election yet, nor has he even been nominated by his party—which is in a tumultuous battle over who can run on the ticket. All the while, candidates from both camps have signed up to gather signatures to appear on the ballot. 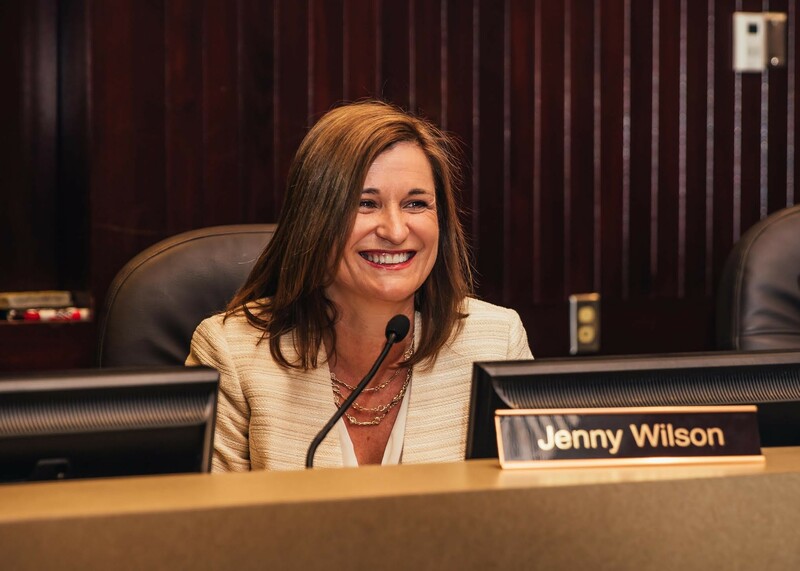 Or in the case of Salt Lake County Councilwoman Jenny Wilson, she decided to go the convention route and started campaigning before Hatch revealed he wouldn't run for an eighth term. Stocking her quiver with political arrows specifically barbed for the incumbent senior senator, Wilson admits without hesitation that she'd rather have campaigned against Hatch. Regardless, she's not deflated. 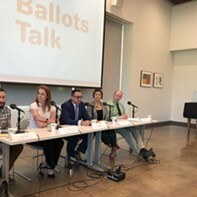 Wilson senses a shift in the political climate that she thinks opens up the opportunity for a Democrat to have a puncher's chance in a statewide election. "I feel that this is such a unique year and traditional rules don't apply," she says. Part of that might be a reaction to Trump, who's a different brand of GOP than those who have won a majority of the vote in Utah. 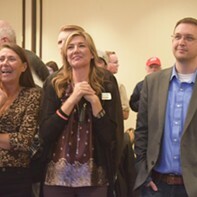 And locally, a faction in the Utah Republican Party recently fueled a simmering civil war that divides the GOP into those who want to nominate candidates through the caucus convention versus those who support a signature-gathering method. The battle led to a rule change on Feb. 24, which critics say is illegal and could strip the Republican Party of its "qualified political party" status. 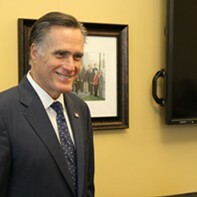 A January poll conducted by The Salt Lake Tribune and the Hinckley Institute of Politics, however, indicates Wilson trails considerably behind Romney. As of press time, Romney is joined by three other Republicans who intend to gather 28,000 necessary signatures to qualify for the ballot: L'Capi Titus, Alicia Colvin and Jay Hiatt. Mitchell Vice is the lone Democrat who is considering a signature-gathering path at this time. Wilson, who opted not to gather signatures but instead take her chances at the Democratic convention in late April, currently appears to be Romney's likely opponent. Wilson bills herself as a fiscally responsible reformer who is strong-willed yet open to compromise. On the county council, she's backed initiatives in the mid-2000s to extend health benefits to family members of LGBTQ county employees and supported imposing strict limits on gifts to elected officials. "For me, these issues are a matter of fairness and a matter of compassion," she says, adding federally, she's pushing for Medicaid expansion, as well as publicly financed campaign reform. In the '90s, Wilson worked in Washington, D.C., as chief of staff for the late Rep. Bill Orton, D-Utah, and she highlights her experience in Congress as a boon to her campaign. But she also remembers a time when Utah's delegation had members from both parties. "What I feel is so needed in this federal delegation is a different voice. I'm not going to go in and take over as a Democrat if I'm elected to the U.S. Senate," she says. "I'm going to bring a voice for a lot of people in this state who haven't had a voice." Not as high-profile as Trump, Wilson has a reliable supporter in her own corner, a man who calls Romney a friend and a former three-term Salt Lake City mayor—and who also happens to be the candidate's father, Ted Wilson. Ted Wilson noticed his daughter's early aptitude for connecting with folks. He remembers, for instance, taking Jenny to political events when she was a teen and seeing a spark in her as she interacted with others. "I knew from then on that she would be good at politics," Ted Wilson says. "She's got a tough skin on her. She takes criticism seriously but doesn't let it ruin her general disposition. She's always had a toughness about her and a willingness to jump in and take on projects that might seem impossible." A bid for a U.S. Senate seat against Romney, who Ted Wilson describes as "a guy who's almost a God in Utah politics," will be a slogging contest. Ted Wilson considers Romney a close friend and praises the former GOP presidential nominee for playing an integral role in rescuing a floundering 2002 Winter Olympics. But even he says Romney's purchase of a local home seemed to be a calculated move. Jenny Wilson is a fifth-generation Utahn, he says, whose great-great-great-grandfather Orson Pratt descended into the valley two days before Brigham Young in 1847. As for long odds, Ted Wilson can empathize; he ran unsuccessfully for the same seat in 1982 against incumbent Hatch. He says success shouldn't be measured merely by the election results, and he's optimistic the race will be positive no matter the outcome. "She's a winner either way," he says. "If she gets the nomination, I expect she does a good job and makes Mitt respond to tough questions. She'll keep a good spirit, and it can turn out to be a very positive experience." That's assuming Wilson makes it that far. If her efforts are being overshadowed by Romney, Democrat Mitch Vice's campaign is eclipsed by both of them. Less visible than Wilson, Vice is the only Democrat as of press time registered with the lieutenant governor's office to gather signatures. Vice's lack of exposure seems to correlate with fewer resources. Wilson considers herself the Democratic frontrunner partly because of the steady flow of contributions she's collected. By the end of last year, Wilson had raised more than $410,000—more than 200 times the amount Vice had reported (about $1,700) with the Federal Election Commission. "It's not discouraging; it's politics," Vice says. "I have more will than money. The thing about money is it's prohibitive to the common citizen to get involved, and the common citizen is the one being affected by money. Money isn't always the answer." Now in marketing and advertising, Vice grew up in Los Angeles but moved to Utah around 1993 to work and raise a family. He contends he brings a salt-of-the-earth perspective to the race. "I'm just a working-class guy that has been forgotten by the Democrat party," he says. "I am just a working-class Joe, never been in politics before other than being a very frustrated citizen. I'm here taking a stand for the working class." Economic and social justice are priorities, and finance reform is a centerpiece of his campaign. At a time when politics are polarizing, Vice aims to focus on constructing ideas rather than demolishing others, a tactic he believes Democrats have relied on at their own peril. "They're not making a connection to the citizens. There's no message. There's no vision. No one knows what Democrats stand for other than 'We've got to fight Republicans' or 'We've got to fight Trump,'" he says. "Look, can we fight for something instead of against something."